The MSI GT75 VR looks like a solid desktop replacement, but it’s too early to call it without a closer look at the screen, and at just how far we can really push the system. The GT75VR Titan is the first MSI gaming laptop to see a mechanical keyboard truly designed for a notebook. "Actually, the MSI GT80 Titan was the first," you might well exclaim – but that was a 18.4-inch beast with a keyboard meant for a desktop. By comparison, the MSI GT75VR Titan is an almost portable 17-inch laptop with a low-pile and tactile keyboard. It's still a monster of a machine, with an overclockable Intel HK-series processor and up to an Nvidia GTX 1080. However, without any pricing details, it’s too early to call it a winning rig. The centerpiece of the MSI GT75VR Titan really is the newly developed SteelSeries rapid RGB mechanical keyboard. And there’s no way to miss it really, especially if the keys have been programmed to sparkle with a rainbow of colors. Despite this not being a desktop-grade keyboard, the new rapid RBG mechanical keys offer a satisfying amount of key travel and click – they feel awfully familiar to the ones on the Razer Blade Pro. Aside from the keyboard, though, the MSI GT75VR Titan looks almost identical to the GT73VR Titan. The only real stand-out difference between the two models – aside from the keyboard – is the new 'pleather' palm rest that has a peculiar diamond-shaped cut around the offset arrow keys. The soft material is much more comfortable than the basic plastic frame your wrists are left to hang on with most gaming laptops. The MSI GT75VR can be specced up with the best mobile hardware on the market, including an Intel Core i7-7820HK processor and Nvidia GTX 1080. MSI hasn’t said if the HK-processor will be the CPU in the base model, but there are multiple graphics options, including the Nvidia GTX 1080 previously mentioned, as well as the Nvidia GTX 1070 in SLI and single-card configurations. 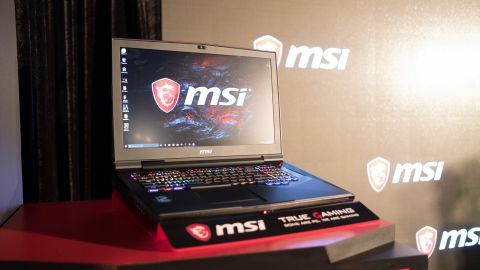 Users can also choose between three 17.3-inch screens, the first of which is a Full HD, TN display with an 120Hz refresh rate that MSI claims can render HDR-like colors. From our initial impressions, the TN screen renders colors brightly, although we can’t yet say if they’re accurate. That said, if you’re really concerned about color accuracy there's also a Full HD IPS panel option, and an UHD (3,840 x 2,160) monitor with 100% Adobe RBG coverage. Otherwise, the MSI GT75VR Titan is designed to be a full-on desktop replacement with space for up to 64GB of DDR4 RAM, one 2.5-inch HDD and two NVMe M.2 SSDs. Perhaps the most impressive part of the GT75VR is the Cooler Boost 5 Titan Technology, which allows the laptop’s CPU to overclock all the way to 4GHz. This system essentially combines two Whirlwind Blade fans with 12 heat pipes and four ventilation points. Unfortunately, MSI has yet to say how much any of these hardware configurations will cost. If you’re looking for a gaming laptop with serious hardware and a mechanical keyboard, the MSI GT75VR Titan makes a lot more sense than the MSI GT83VR Titan ever did. However, this system is also coming into a space with plenty of competition, and it’ll be hard to pick this thick gaming laptop over thinner systems like the Alienware 17 and Razer Blade Pro. After the announcement of Max-Q, it’s hard to consider a traditional desktop replacement when the Asus ROG Zephyrus and Acer Predator Triton 700 could offer the same experience in much more compact packages.